Until recently, Italian cuisine in Paris wasn't particularly something to write home about. There were a handful of very decent, family-owned pasta and pizza places that would occasionally serve up some marvelous local dishes, a smattering of restaurants with mentions in Michelin guides and a much larger crowd of mediocre chains that didn't do Italian gastronomy any real justice. But in the past few years, that's started to radically change: a new generation of young Italian chefs and sommeliers in search of opportunity uprooted to Paris, opening mostly small outfits focused on fresh ingredients imported from specific Italian regions. They're also offering new twists on old family recipes and regional specialties, from Napolitano-style pizzas to traditional Sardinian dishes most of us have never heard of. Oddly, a significant number of our picks below are clustered in the same area of central-East Paris, suggesting that there's a genuine culinary and cultural community currently flourishing in the 11th and 12th arrondissements (districts). Bringing a sense of familial warmth coupled with stylish and attractive presentations, these eateries and "bottegas" are shaking up Parisian cuisine — for the better. They also tend to be very vegetarian-friendly, adding more options for non-carnivores in the French capital. Below are our picks for the best places to score delicious Italian plates in the capital at the moment — most new places, with a couple of well-established addresses among them. Tucked on a quiet street between the trendy Voltaire-Oberkampf district in the 11th arrondissement and Pere-Lachaise Cemetery further north, this tiny eatery packs homemade Roman cooking with a decidedly modern focus on local ingredients and creative presentations. Co-owned by Flavia Federici, a former architect-turned restaurateur from the Italian capital who wanted to bring back to life — and reinvent — her grandmother's recipes, the cramped but pleasant and cheerful bistro serves up marvellously simple, intensely flavorful dishes. The straightforward, uncluttered menu generally includes a homemade lasagne that's rotated every day, a main dish (generally fresh pasta), soup of the day and an eggplant "gratin". The desserts, including the generously portioned tiramisu that could easily satisfy two sweet tooths are equally delicious. Lauded by foodies as one of the very best new Italian kitchens in the capital, Osteria Ferrara is the brainchild of the Sicilian-Milanese couple Federica Mancioppi and Fabrizio Ferrara, former owners of the much-beloved Caffe des Cioppi. Fans were relieved when the couple revived their culinary talents at the present-day restaurant, serving regional and traditional dishes that keep patrons coming back again and again. Try the "pizza fritta": an indulgent fried dough that's topped with ingredients such as speck, radicchio and pecorino; fresh pastas with a focus on fresh, invigorating flavors; or burrata cheese straight from Puglia, served with fresh, crunchy beets. The wine list features numerous excellent Italian vintages and the prices are generally reasonable here. The one downside? They're not open on weekends, so make sure to reserve your table before they all get snagged during the weekdays. Opened by Roman native Pietro Russano — a former chef and sommelier in Italy who decided to bring his culinary and wine-related talents to the French capital — Retro Bottega is another tiny eatery offering remarkably inventive and delicious Italian dishes. During the day, it's a cramped but adorable wine shop, with all vintages (mostly Italian) selected by the chef-sommelier; by night, patrons crowd into the place to occupy the few small tables and sample Russano's creations. Behind the scenes, the kitchen is tiny and the cooking is partially done on hot plate stoves, but the results are no less delicious or colorful. Tradition-inspired dishes such as buffalo mozzarella, tomatoes and melting aubergines drizzled with grape must are served alongside more daring creations, such as homemade ravioli stuffed with crab and accompanied with bright cioggia beets, sea asparagus, and toasted sesame seeds. Owner Pietro, ever the sommelier, has a fine-tuned sense of which wines will pair best with a given dish and is always happy to make suggestions for a glass or a bottle. His selection includes numerous natural, organic and biodynamic wines, primarily of Italian and French origin. The one downside? It's a bit pricey, and there are no fixed-price menus on offer; it's also not possible to order a half-bottle of wine, meaning the meal quickly becomes costly if you're hoping for more than one glass with dinner. The restaurant is open daily for lunch and dinner, with the exception of Monday (dinner only) and Saturday (lunch service only). Reservations are recommended. 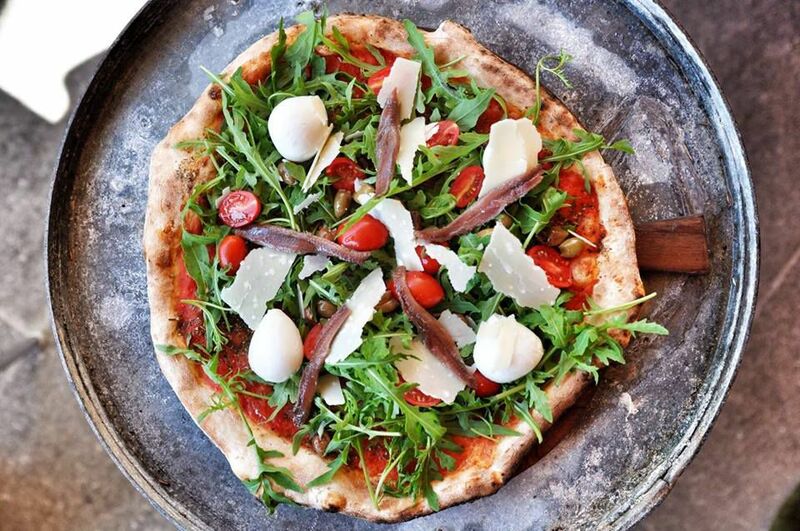 We'd be remiss if we didn't include the 20-year-old Amici Miei in our picks for the capital's finest Italian eateries. Having earned a reputation for making some of the best — if not the best — pizza in Paris, this Sardinian trattoria offers no fewer than 24 varieties of delicious pies, including several white pizzas. The wine list is refined yet accessible and the pasta portions are well-known for being incredibly generous for Paris — try their signature rigatoni with pistachio pesto, or risotto with langoustines. For dessert, tuck into the much-lauded strawberry and basil panacotta, particularly refreshing in the summer. Be prepared for a bit of a wait, though, especially on weekend evenings — long lines snaking outside are a common sight here. Moving into a pricier category, the elegant Sardegna a Tavolo — situated in a quiet, charming street in close reach of the Place d'Aligre and its vibrant food and flower market — offers a rarefied but warm ambiance and a very good introduction to the best of Sardinian cuisine. It's not the most accessible of our picks, but definitely worth a try for a special occasion. Opened in 1996, it's another Italian institution in the city, rather than a newcomer. It's owned by Tonino Simbula, who proudly serves up authentic Sardinian specialties served in relation to what's fresh at the adjoining market, from traditional, crunchy bread served at the beginning of the meal with olive oil and olives, to fresh fish prepared in inventive ways to tagliatelle with langoustines and orange. The pricey, but excellent, selection of Sardinian wines will complement the meal beautifully. This always-packed "ultra-trattoria" in the rapidly gentrifying Charonne district might at first turn some off for its clear embrace of hipsterism — but the friendly, warm service and delicious Napolitano cuisine from chef Ciro Cristiano will change hearts and minds. The wood-fired pizza is simply delicious, with a melt-in-your-mouth quality that's the trademark of the famed Naples pie. If it's on the menu — they change monthly — try the pizza with fiore di latte cheese, zucchini flowers, fresh tomatoes and basil. The ingredients, all carefully selected and imported from Italy, are too fresh to lie to the palate. Pastas, equally creative, are served in cheerful, un-fussy copper pans in lieu of traditional plates. The wine list is generous, balancing reasonably priced Italian wines with more rarefied offerings. The owners have another restaurant that's equally popular, Ober Mamma, in the French capital, so don't despair if you can't get a table on a busy night — try the other address. Just make sure to get there as soon as the place opens — or risk waiting in hour-long lines. La Trattoria Pulcinella is especially reputed for its mouth-watering, authentic Italian desserts — but it also offers delicious pizzas, generous pasta dishes, salads and antipasti platters, all at reasonable prices. Owned by the Piccolo Rosso group, who has three other very good Italian-themed restaurants in Paris, the Pulcinella is regularly cited as the best of the lot by the gastronomically savvy. Try the homemade panna cotta with strawberry coulis or the tiramisu, both intensely creamy and delicious. Note: this restaurant is only open for dinner.